I was in Mr. Tucker’s 7th grade math class at Andrew Carnegie Intermediate when the principal’s voice crackled over the school PA. “The president has been shot,” he told us. “If you pray, pray now for him and for our country.” Bill Webster the principal was from Massachusetts and knew JFK. His office (which I visited occasionally when in trouble) had only one small picture in it: Kennedy’s presidential photo. When class let out, we learned that the president had died…and this school of over a thousand 7th and 8th graders went silent. We were all shocked to see our teachers crying or dabbing their eyes…even the coaches. Webster came on the PA again during our subdued lunch period–crying and sobbing as he told us the sad news–and that he had called the busses to pick us up and take us home. I found my mother puffy-eyed and grabbing Kleenex when I got home. 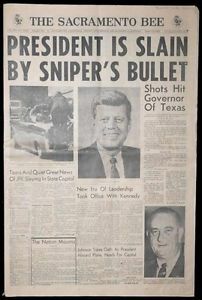 That afternoon I delivered the Sacramento Bee to my 65 customers with its screaming headline: PRESIDENT KENNEDY IS DEAD. It’s hard to describe to those who were not alive at the time or who were in diapers just how big a wound this left in our hearts. We loved JFK and his family–his youth, his optimism, that wonderful smile–and the possibility of change. “Let’s get this country moving again” he said when running for president in 1960. His accomplishments were few compared to some (he had no Hundred Days like FDR) and his actions on Vietnam reflected the Cold War ideology of nearly everyone in the establishment. He wasn’t going to “lose” Southeast Asia as Truman had allegedly “lost” China. On Civil Rights, he may have saved Dr. King from being “accidentally” killed in a Georgia prison, but he lived in too much fear of mossback Southern Democrats and Republicans in congress to take the kind of action he should have. His brother Bobby was far too cooperative with the likes of J. Edgar Hoover. But Kennedy inspired many in my generation–yes even after we have heard of his sexual failings delivered regularly by the Puritan Pornographers of the right. We missed him and his brother Bobby…they reminded us of the promise of our youth. This country could be a better, more just, and generous place. I still believe that.